When the blitz started when we were living in a terraced house in Greenfield St. in Deptford, and we had to have an Anderson Shelter built in the garden. The workmen brought it and they dug the hole and installed the shelter. Half of it was above the ground, but the floor was about four feet below ground. They fitted some benches, which were most uncomfortable, and water seeped in from the ground making it soaking wet most of the time, but we slept down there nearly every night throughout the blitz in 1940-41. At one time we didn’t even wait for the air raid sirens to go off because the raids were nearly every night. There were an awful lot of houses damaged, and many of those that were not flattened had to be demolished because they were unsafe. When we went up the high street in the morning after a raid there were plenty of shops that had been hit and the big factory where they made parts for fire engines, was destroyed. The Surrey Docks were not far away, and one night they were badly hit. We could see the sky all red from the fires. My brother, Stan, had a friend who was in the auxiliary fire brigade and he got killed that night on the docks. It was very sad - his mother had already lost her other two sons and her husband to tuberculosis. On Blackheath, outside Greenwich Park gates, there used to be a huge hollow where the fair was set up every bank holiday. During the war they filled it right up with the rubble of the buildings that were destroyed, and now that part of the heath is flat. Most of the raids were after dark. We didn’t always go down the shelters, but it was so tiring if the air raid warning went in the night. We three girls slept in one room downstairs. I was always on the end and I had to go tearing up the stairs to wake my father up and tell him that the alarm had gone, because he was deaf and didn’t hear the siren. Then we’d all go down the shelter. It was horrible to be woken like that night after night, and really tiring. We had a dog at the time and he soon learned what the sirens meant. For daytime raids, as soon as the back door was opened he ran out to be the first one down, and at night he slept there. Sometimes he took his bone down and woke us up gnawing away at it. Then we’d kick him to make him leave the bone alone. The worst period was during the blitz, which lasted for 6 or 9 months overall. As the Battle of Britain went on the RAF knocked a lot of the bombers out of the sky, and then things were a bit better. On Blackheath there was a huge anti-aircraft gun called Big Bertha, which used to belt out at night, with batteries of searchlights trying to pick out the bombers. The searchlights all over the sky at night were spectacular to watch, until the sirens went: then we ducked down into the shelter. My father was usually the last one down, as he was deaf and stayed outside looking up at the sky, oblivious to the shrapnel falling all around and hitting the shelter roof. We had to shout at him to come down in case he got a lump of it on his head. I suppose quite a few people must have got killed with shrapnel. The Air Raid Wardens were very hot on lights, and we dared not have even a streak of light showing through the curtains. Even outside there were no lights: patrolling wardens would shout “Put that fag out” if we so much as struck a match. We were allowed to use torches, but we had to be sure they were directed towards the ground. When we went out it was pitch black at night, all the lights were off and you had to have a torch in the winter. Despite the bombing and the blackout we still went out in the evening during the war. 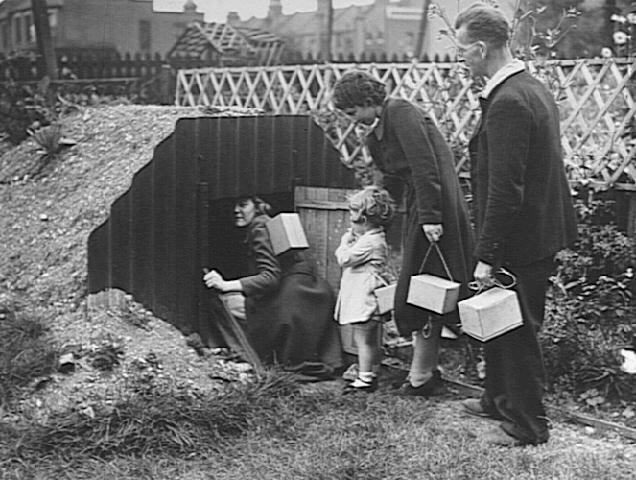 We went up the West End sometimes on the Underground, where people spent the night if they had no air raid shelter. I first saw “Gone with the Wind" in the West End. If the air raid sirens went off while we were in the cinema the film just carried on -we never left. Strangely enough we weren’t frightened; maybe a bit wary, but not really frightened. Sometimes you could hear the bombs going off outside, but after a while we ignored it, more or less. We had guns from the cowboys going off inside and bombs going off on the outside. A lot of people got killed that way, especially in night clubs, by not leaving during the air raids. If we were caught in the street during a raid, it was a different matter – we ran for the nearest shelter. We always ran for cover if we were outside. In Deptford High Street there was a bomb shelter under a big shop- Burton’s, a clothing shop. Everyone out in the High Street when the sirens went off ran for that, and stayed down there until the “all clear” sounded. Most of the raids were at night, and in the morning on the way to work we could see what the bombs had done . The did a lot of damage - knocked down buildings, shops and everything, but Burton’s was never knocked down. There were some American troops in the area and they used to help with clearing up the bomb damage. 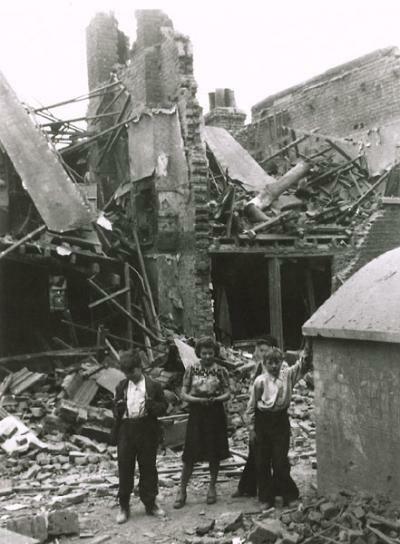 By the time the war ended most streets around Deptford and Lewisham had buildings missing where the bombs had landed. It was amazing really that we came through it all. I’ve heard it said that the people who stayed at home suffered worse that the men who were in the army in some areas. The civilians took the brunt of it all. Towards the end of the war my Aunt Martha moved to Adolphus Street, and there was an empty house next door and this one had 3 bedrooms. So we packed up our stuff and moved next. Although the war was coming to an end, there were still air raids and the Germans also sent over the “V” weapons, doodlebugs, mostly during the day. There were no warning sirens for those: the buzz would get louder overhead the bombs could be seen going through the air with a flame coming out of the end. The only time we were wary was when the noise stopped . Then we ducked for cover, because when the engine stopped the bomb was going to come down. Once in Adolphus Street, when I was 19 or 20, I was sitting at home with my father when there was an almighty bang. I got down on the floor and my father got down on top of me to cover me up and we stayed there for a little while. When we got up the windows were all gone and the ceiling was down. There had been a land mine - they used to come down on parachutes - at the bottom of the street and 22 people were killed that night . All the houses round about had lost windows and some had their doors blown off. All our bedroom and living room windows went . We went to see what had happened after the “All Clear” sounded: it was dreadful to see the bodies lined up in the street waiting for the ambulances to take them away. We got off lightly by comparison: we were given dockets to get our sheets and curtains replaced and because the war was still on they came round and boarded over the windows. We had no daylight in the house for a while, until we could get the glass replaced. I wish I’d kept a ration book. We were rationed to an ounce or two of cheese a week, there was a sweet ration, and a meat ration. It was impossible to buy an egg during the war. I don’t know why- there were plenty of new laid eggs in the shops before the war, and the hens must still have been laying, so I suppose the eggs went to the troops. The rest of us bought egg powder which was mixed with a bit of pepper and salt and milk, and whisked in the frying pan like an omelette. Bread and potatoes weren’t rationed, but everything else was. Almost everything we bought, including clothing, we had to give up coupons, and there were dockets to allow replacement of bedclothes and other things destroyed in the raids. 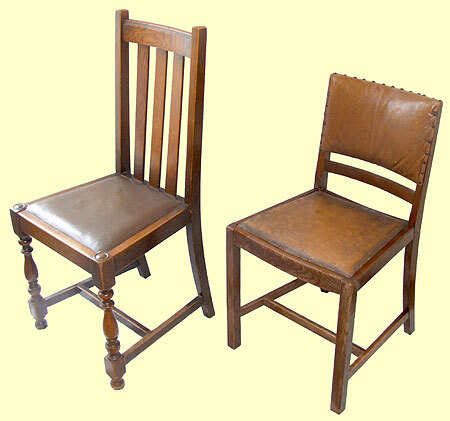 The only new furniture that was made was ”Utility” furniture, which was well made of good wood, but of a very plain and economical design. The manufacturers were not allowed to make anything else. 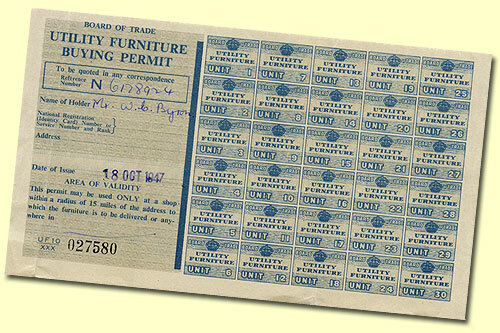 Rationing continued for a long time, even after the war was over. 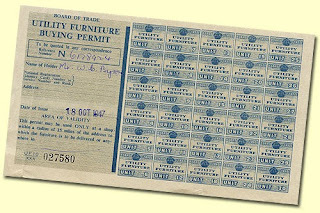 In fact rationing of a few things lasted into the 1950’s.